Introduction and Uses: A delightful annual with feathery, light, soft foliage and star-like flowers. This one is an exclusively yellow-orange flowering species, with protruding yellow and black center. The plant is suitable for cut flowers, borders, flowerbeds and also for growing in a mass in the midst of tall shrubs. It can be grown in pots and containers as well. Orange cosmos flower attracts many species of butterflies. Therefore it is grown in a butterfly garden as a nectar plant. 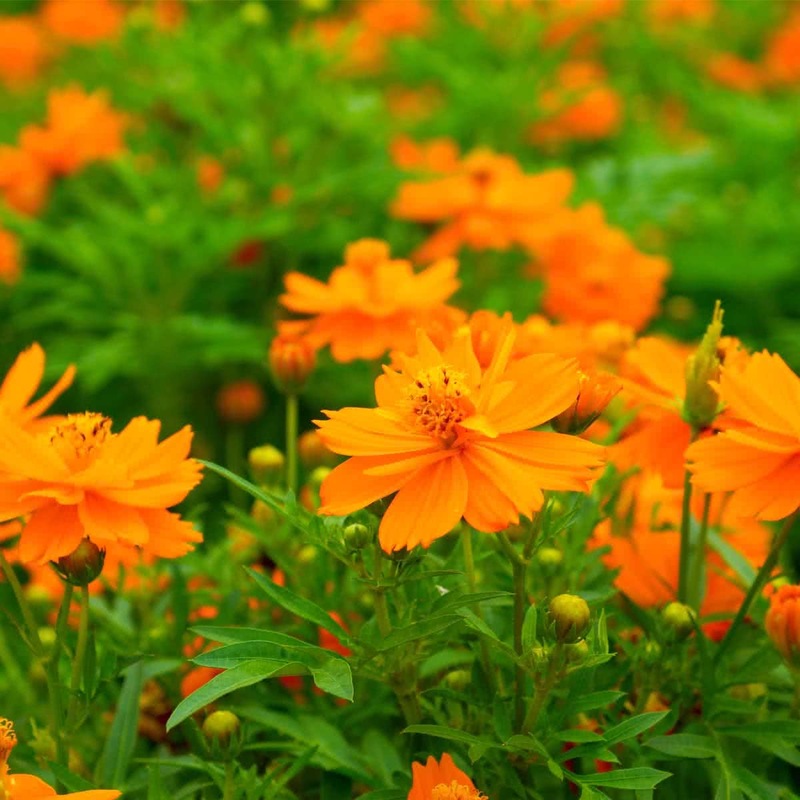 In India, Orange Cosmos has escaped from gardens and has started growing as a naturalized weedy plant. Flowering/ Growing Season: Throughout the year. ; mainly grown in the rainy season. 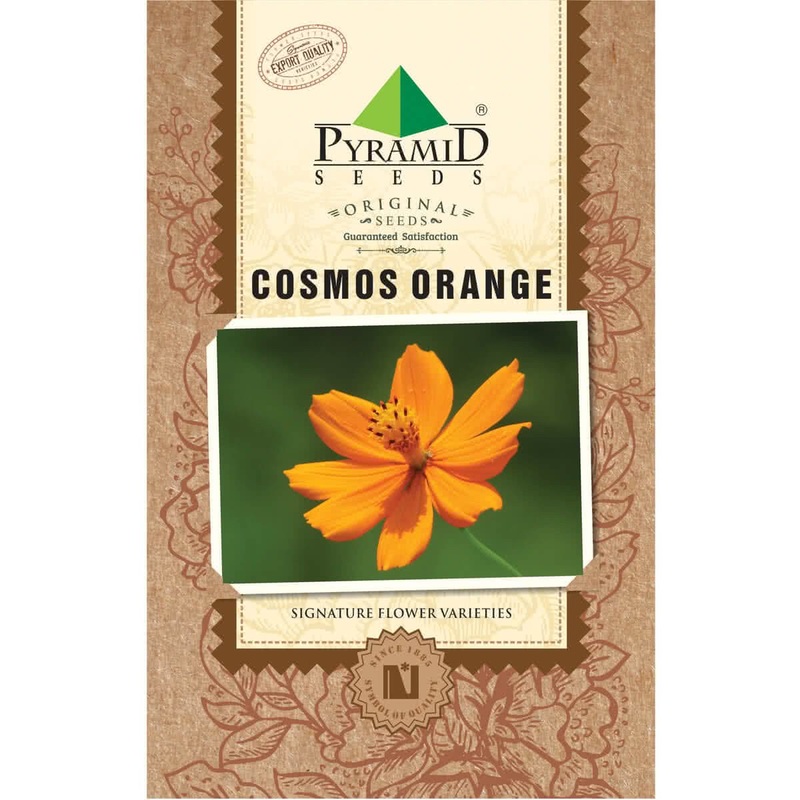 Orange Cosmos is grown by direct seed sowing in pots, containers, and flower beds. Seeds can be sown throughout the year, however best time to sow seeds is in May-June for monsoon flowering. For beds and borders, seeds can be broadcasted directly and evenly on soil, and extra seedlings can be thinned out 25-45 cm apart. If grown by transplantation method, the seed is first sown in seedling trays, and seedlings are transplanted to flowerbeds/pots after one month. Watering: The plant requires plenty of watering. No need to water when grown outdoors in rainy season. Feeding: Plant is not a substantial feeder. Fresh compost should be added to soil at the time of planting. Plant care: It a hardy plant that doesn't catch many pests or diseases. Spray appropriate medicines if there are signs of an infestation. Read about types of insect pests in your garden. Bloom time: Plant takes about 2.5 to 3 months to bloom. Buy variety of flower seeds online.